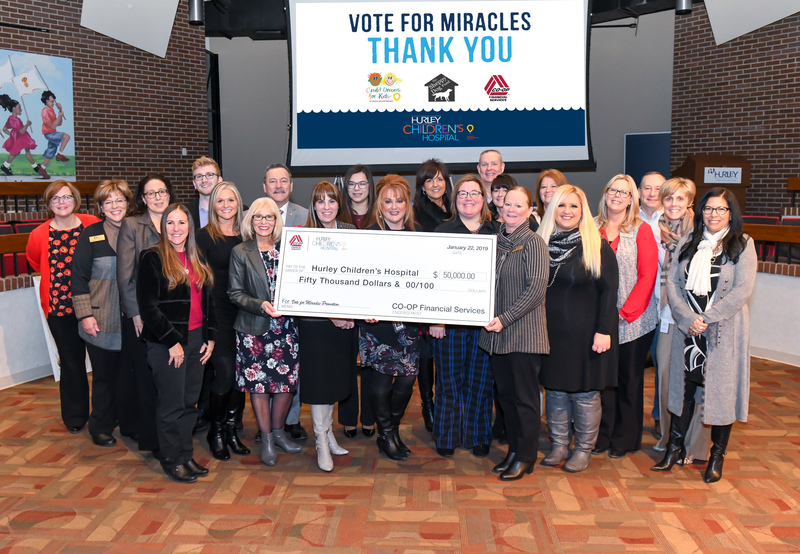 In December 2018, Hurley Children’s Hospital of Flint won the third annual Vote for Miracles campaign — a three-week contest put on by Credit Unions for Kids wherein credit unions and the general public vote to support their favorite Children’s Miracle Network (CMN) Hospital. Hurley Children’s Hospital was awarded the top prize this week — a $50,000 check, which they plan to use to toward the general pediatric program for new equipment and wherever the need is the greatest. This is the third consecutive year the Flint-based hospital has won the contest. Hurley ended the contest with 240,025 votes. When asked what this kind of contribution says about Flint’s community, Tracy-Stephens said support for the hospital was felt from all over the globe as votes came in from England, Japan and the Philippines. “We so appreciate everyone who took the time to vote, whether it was once every day or just one time. Every vote mattered! And we are very grateful to our local media partners and community businesses and other local non-profit agencies that rallied behind this effort,” said Tracy-Stephens. Votes for Hurley Children’s Hospital were rallied, in part, due to the enthusiastic effort of area credit unions, such as: ELGA Credit Union, Dort Federal Credit Union, Sovita Credit Union, Financial Plus Credit Union, Security Credit Union and Catholic Federal Credit Union. Church told MCUL that ELGA is grateful that CO-OP Financial Services, a sponsor of the campaign, allows an opportunity for all credit unions to get their staff and members involved to win the generous prize. This year also marks the second year in a row that the Helen DeVos Children’s Hospital in Grand Rapids placed in the top five, showcasing how involved the state has been in this national contest. CO-OP Financial Services has supported CMN since 1996 and “is proud to support this contest as it creates more awareness and visibility for CMN Hospitals, as reflected by the more than 700,000 votes!” said Locklear.